Cool Stuff! has links to some cool free stuff, information and demos on the internet, including fonts, graphics, Photoshop, Director, PageMaker & InDesign, and Macintosh stuff. 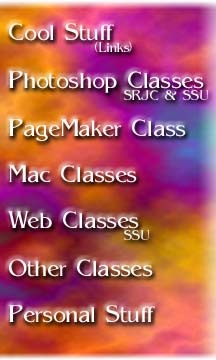 I have taught Intro to Photoshop and Intermediate Photoshop at Santa Rosa Junior College. The Assignments will be available on my Photoshop page. I also have the handouts for the classes I teach for Extended Education at Sonoma State University. I have also taught other classes for Extended Education at SSU. Subjects include Care & Feeding of the Macintosh, using Graphics, and Mac Tech Talk and Troubleshooting. On my Personal Pages, you will find my puppies, my wedding, my resume and some cool vacation pictures.